Thank you for joining me for this series. I hope we can share and learn together. Now, let's get started. There are all kinds of gentlemen. In fact, you can tack just about any adjective in front of the word 'Gentleman' and you'll arrive at a different result. We assume that a gentleman is also a good man, but there are cases where the two are mutually exclusive. Why? Because being a gentleman has to do with etiquette and manners, while being good is a moral issue. They are two different things. However, our focus for this series is the Quintessential Nigerian Gentleman. Because he exists. In modern times, the concept of a gentleman is a social construct. Society depends on culture, and vice-versa. The contemporary Nigerian man is a hybrid of sorts: he is a product of a society that has strong cultural beliefs, but he also has to navigate a world where tradition is giving way to modern ideas. In other words, he has to learn to balance traditional beliefs with modern beliefs, courtesy of Western civilization. While I am aware that the original idea of being a Gentleman is not an African (or a Nigerian) thing, I would argue that it should be. Being a gentleman essentially relates to how you treat people, most especially, women. Unfortunately, when we mention the word 'Gentleman,' the image that springs up in the minds of many people is that of a weak, emasculated man. A total push-over. Well, I want to correct this. Nigerian society is a patriarchal one. It's undoubtedly still a male-dominated society where women are expected to submit to the men in their lives: husbands, fathers, uncles, pastors, etc. It's a society where men make the rules that everyone follows. So, what are the rules that men make with respect to how other men should treat and value women? Let me answer with a few illustrations. If you are a Nigerian or African, or have ever been around them, you might have heard this phrase: A woman should not talk when a man is talking. The reverse of course is not the case, and it is common for such men to interrupt or even demean / deride women who voice contrary opinions. To such a man, the woman's opinion is not important. The man's opinion is the valuable one. As such, a woman is not expected to interrupt a man when he is giving his very valuable opinion. One of the accepted and common attributes of a gentleman is that he must be polite. Regardless of culture or tradition, I would add that the Quintessential Nigerian Gentleman MUST be polite. Polite, as in "marked by an appearance of consideration, tact, deference, or courtesy." [Source] This definition is important because it connotes valuing and respecting another person's opinion and according him or her respect regardless of power or position. I want to dissect this definition a bit. Consideration and Tact: I don't think enough Nigerian men take this seriously, and I would certainly love to see that change. I think it is tactless and in bad taste for a man to "shout down" a woman or resort to calling her names simply because she does not conform to his myopic and unhealthy view of women. Or worse still, because he disagrees with her. That small-mindedness has got to go. You can make your point politely. I believe that a man learns to be (or not be) a gentleman from the most powerful and respected man in his life, which is usually his father. But, that is not an excuse to continue a negative trend. Even if your father was not a good role model, you can decide to be a better one for the sake of your children. It's a choice. Deference: This is where the concept of what it means to be a Nigerian (or an African) man is somewhat messed up. It is common to hear Nigerian men say that if a man is a man, he will not allow a woman .... (fill in the gap e.g. talk to him in a certain way, make certain decisions, do this or do that). That is an outright abuse of power. A gentleman is a man who understands the power he commands, but is able to control it. That means deferring to a woman in cases where her ideas are superior. It does not make you less of a man. Courtesy: Being courteous is highly underrated in Nigerian society. Seriously. It will not kill you to be respectful and have good manners. Like I already said, it does not make you less of a man. One last thing: Being polite is not reserved for the work environment only. Please learn to be polite at home too. 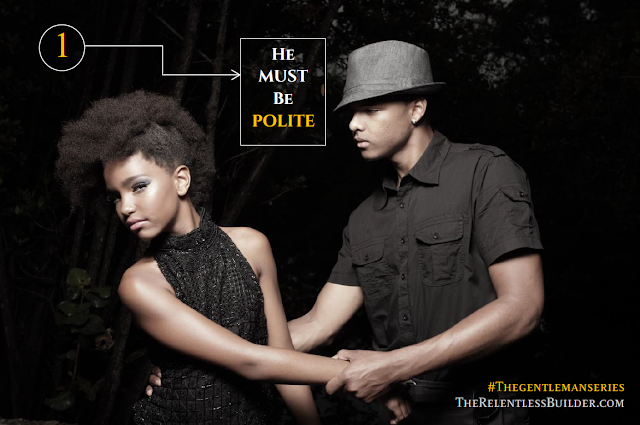 Your turn: Do you think the average Nigerian man, generally, is polite? Is politeness even part of Nigerian / African culture? Kindly share. Episode 2 airs next Tuesday. Stay tuned. Nice start to a wonderful series! I totally agree with you, being polite does not emasculate a man, rather there is great strength in knowing that you have power yet know how to appply it well to do good and not cause problems. It is unfortunate that chivalry is dead in the African culture (in fact was it ever alive? Lol) but I believe there is hope for our wonderful African men! 1 + The One: Was chivalry ever alive? That's a very good question. I think it has always been there, but it seems to get watered down with each new generation. We need to figure out how to reverse that process. You're right on both men and women needing to be more courteous. Even here in Blogsville, it is obvious and desperately needed. Thanks and hope to see you here for Part 2. Toin: I thought so too. It's good to hear confirmation. The polite Nigerian men are definitely in the minority. The problem is that the majority don't see the need to change. It is still considered part of being a man. Your dad would be so proud to read the last line. Omo-daddy proper proper! P.S. You are glowing in your pishure ;-) Is it a magic? Lol! Unfortunately, when I think of the average Nigerian gentleman, I picture someone who has been brought up abroad or someone whose parents raised them in a 'Western' manner. For the others, I think they do know how to be polite but whenever I see that, it is usually in a context that the man wants something from the woman or is being condescending. A true gentleman is polite to all women (not just someone he wants to sleep with). The good thing is that as our culture is being infiltrated by Western thinking (which isn't always a good thing.. tory for another time), more people (men and women) are learning to be polite - if only to save face and act a little tush. Can't wait to see what else lies in this series! Jemima: Thanks for mentioning the polite codes. I had not even thought to address it because of the topic, but it's given me food for thought. Do Nigerian men understand these codes as per men to women? Who defines these codes? What's the agenda? I wouldn't say African men are cave men, because that would be supporting a certain Western stereotype, which I disagree with. But I think our men have a lot to learn on how to treat women with respect. And I agree: it's always a pleasure to meet a man who understands that politeness does not kill. You should wear it on your person every single day. Better yet, it should be part of your character. 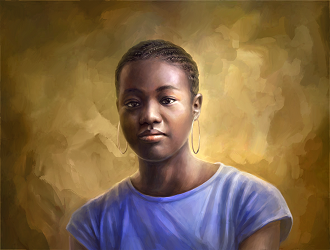 Dayo: I'm really glad you brought up this issue, i.e. the fact that when you meet a Nigerian man who you would consider a gentleman, more than likely, this person is also more exposed, widely-travelled, and generally more cultured. I have noticed it too. My favorite line in your comment: A true gentleman is polite to all women (not just someone he wants to sleep with). I agree 100%. Thanks for following along (and participating).